For a creature that’s typically less than six millimeters in size, bark beetles certainly have a mammoth footprint. Outbreaks of the tiny insects in forests across western North America have changed millions of trees into shriveled, rust-colored sentinels of a changing ecosystem. In Utah alone, between 1990 and 2005, wood-boring beetles ate their way through more than 466,000 acres which equals 3% of Utah’s total forested area. Bark beetles are native to our forests and evolved together with their respective hosts. For example, the Douglas-fir beetle evolved with Douglas firs, and the spruce beetle with Engelmann spruce. The mountain pine beetle is the least discriminating. It attacks lodgepole pine, ponderosa pine and, more recently, high elevation species such as whitebark pine, limber pine, and bristlecone pine. At healthy population levels, bark beetles renew forests by killing older and declining trees, allowing young, more productive ones to flourish. Female beetles initiate the assault, simultaneously attracting males using pheromones. Within hours the tree becomes the site of a “mass attack” of thousands of beetles. Then the females begin to reproduce. An individual female may lay over 100 eggs. 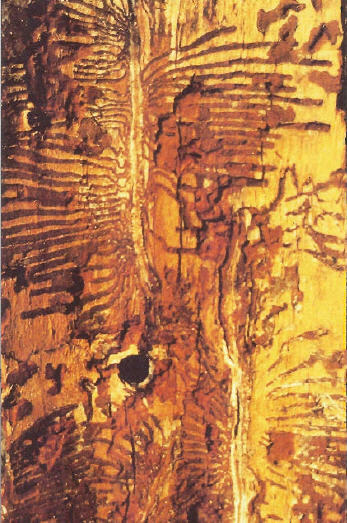 As eggs hatch, larvae construct feeding galleries in the inner bark of the tree. These galleries eventually girdle and kill the tree by cutting off the exchange of nutrients between the roots and the crown of the tree. Some of the biggest outbreaks in Utah have occurred in the Dixie and the Manti La Sal National Forests. The spruce beetle is responsible for thousands of acres of dead Engelmann spruce trees in both of these forests. The Piñon Ips beetle also thrives in piñon pines in southern UT. Meanwhile, on the other end of the state, the mountain pine beetle is causing serious outbreaks in the Uintas. The Wasatch Range forests have yet to experience extensive diebacks but the mountain pine beetle, Douglas fir beetle and spruce beetle are all causing higher mortality rates than they have in the past. Certain forestry management practices are partially responsible for the unprecedented bark beetle outbreaks. Dense, homogenous forests with repressed fire regimes are more susceptible to attack. On the other hand, uncrowded, variable age stands composed of lots of different species are healthy and resilient. 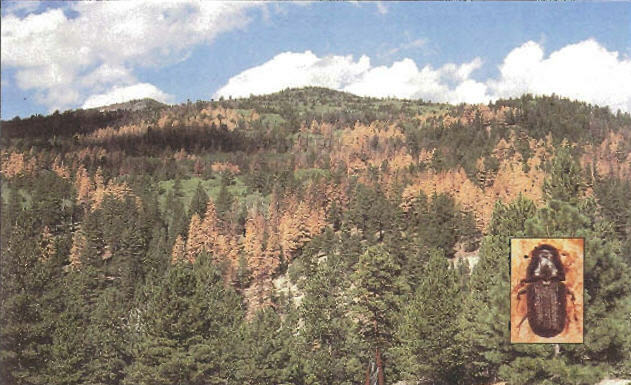 Warming climate conditions have also contributed to the severe bark beetle outbreaks. Early fall and late spring freezes, and extremely cold temperatures help repress bark beetle populations. I’ll try to keep this in mind when it’s snowing in June here in Cache Valley. At least our pine trees will be healthy and safe from the bark beetle. Barbara Bentz, research entomologist with the USDA Forest Service Rocky Mountain Research Station and adjunct faculty member with Utah State University’s Department of Wildland Resources, provided the scientific information for this piece. Thanks to the USU College of Natural Resources and the Rocky Mountain Power Foundation for supporting research and development of this Wild About Utah topics. 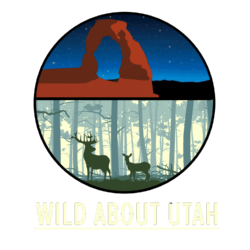 For Wild About Utah and Stokes Nature Center, I’m Holly Strand. Bentz B, Allen CD, Ayres M, Berg E, Carroll A, Hansen M, Hicke J, Joyce L, Logan J,MacFarlane W, MacMahon J, Munson S, Negr?n J, Paine T, Powell J, Raffa K, Régnière J, Reid M, Romme W, Seybold S, Six D, Tomback D, Vandygriff J, Veblen T, White M, Witcosky J, Wood D (2009) Bark Beetle Outbreaks in Western North America: Causes and Consequences. University of Utah Press, ISBN 978-0-87480965-7, 42 p.
Logan, J.A., Powell, J.A. 2001. Ghost forests, global warming, and the mountain pine beetle (Coleoptera: Scolytidae). Am. Ent. 47(3): 160-172. Samman, Safiya, Logan, Jesse tech eds. 2000. Assessment and response to bark beetle outbreaks in the Rocky Mountain aea. Report to Congress from Forest Health Protection, Washington Office, Forest Service, U.S. Department of Agriculture. Gen. Tech. Rep. RMRS-GTR-62. 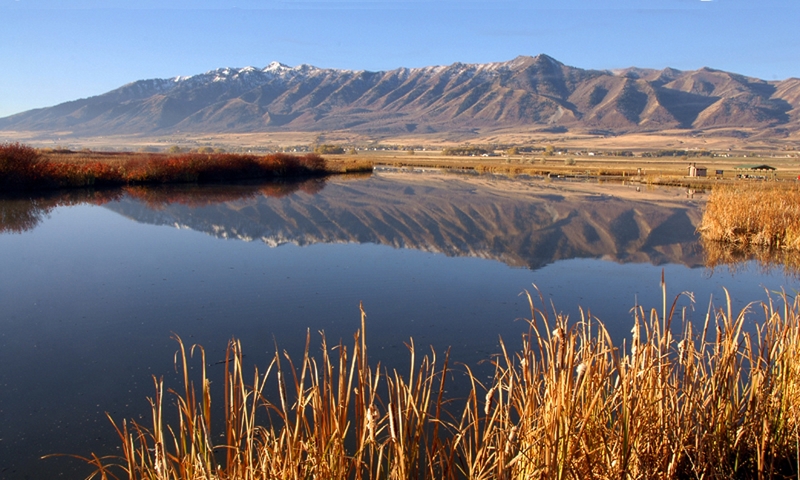 Ogden, UT: U.S. Department of Agriculture, Forest Service, Rocky Mountain Research Station. 46 p.